Kids have all sorts of crazy dreams. Some want to grow up to be powerful wizards that can cast magical spells and others want to be chivalrous knights who fight to protect a kingdom. Your kiddo is different, though, isn’t he? He wants to grow up to be the mighty dragon, destroying castles and hoarding gold! Well, we’d say that is pretty awesome dream and we’d like to help him. Check out this Dragon Costume for toddlers! Once your little one slips into this adorable jumpsuit, he’ll be ready for a mythical adventure this Halloween. The jumpsuit has a pair of wings and a spiky tail already attached and then once you fasten the headpiece on, his transformation will be complete. He’ll feel as if he can fly high above the clouds and make fireballs rain down upon any unlucky village or kingdom he wishes. With this scaly looking costume, he’ll become the most menacing medieval monstrosity stomping around the block this Halloween. Mom and dad can dress up as the pretty princess in pink and fearless knight in shining armor, and then the whole family can be the most adorable fairytale in the neighborhood! 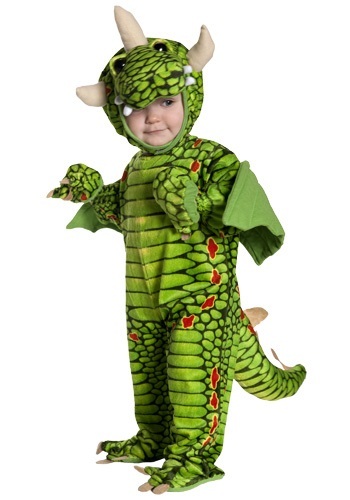 If you’re ready to give your kiddo a truly magical Halloween, get your hands on this Toddler Dragon Costume. Before you know it, your little ankle biter will be a ferocious, green, fire-breathing machine! We understand it may be a bit frightening when you think about telling a dragon to go to bed, but we’re sure you’ll be able to manage just fine… as long as you have plenty of gold coins to barter with.